Inspire. Connect. Transform. Creating a new world of possibilities through art! A promising future author demonstrating her new knowledge of Spanish. Art made from book and computer research helps build curiosity and knowledge. An Arcadia University student contributes to the effort at The Fishtown Recreation Center. North Philly youth process and express their feelings through drawing and acting. High School and College Interns and Business leaders volunteer! Mural painting at McMichael Elementary after learning how to identify flowers and birds. Transforming space for summer school and after school program with local youth. An alternative to graffiti, designed with local graffiti writers. Walls, doors, sidewalks, benches, poles, fountains, trash cans and more painted! Port Richmond youth convert trash filled lot into painted sanctuary playground. More and more, communities across our region are stretched for creative public resources. Declining education funding has forced schools to cut art programs, while shrinking budgets prevent libraries and recreation centers from offering their own visual-arts programs. ASI aims to fill the artistic void in these communities by fostering the visual arts and developing broader skills to help students thrive in all subjects. To get involved visit our volunteer page. 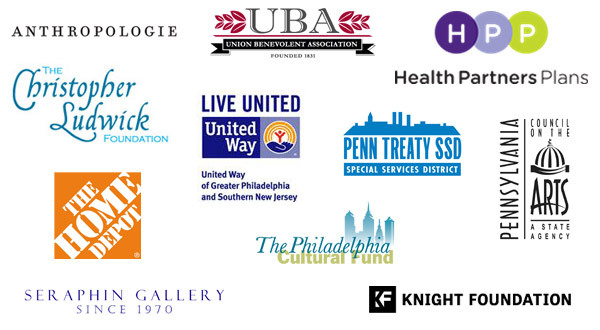 The following sponsors make our programs possible, Art Sphere Inc. appreciates their support.